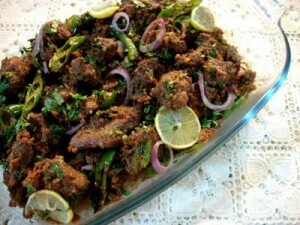 Behari Boti recipe by Mrs.sobia Abdullah at DesiRecipes.com. Mix all the ingridents and leave it for 5 hours or more. Now add water as needed and cook it until meat is tender. Then add 3 table spoon of oil and cook for 5 minutes. Burn a coal and when it is ligtened put a piece of roti in the middle of the pot, put the burnt coal and drop some oil on it and cover with lid immediately. Serve hot with fresh onion slices. I cant believe the commenrs. Dahi is the last ingredient. Serves 4-5 not 45!!!! I like this post style. It was a good read. How come 1/2 kilo meat will serve 45 people. after Dahi where are the ingredients?